One of my favorite meals to have when I come back from an extended journey (particularly of the camping/climbing variety) is BBQ Ribs. I usually go to East Bank Club for real nice rack with Sweet Baby Ray's sauce everywhere, but this go around time was short and we wanted to check out the brick and mortar location of one of Chicago's BBQ institution located down the street from our new apartment. 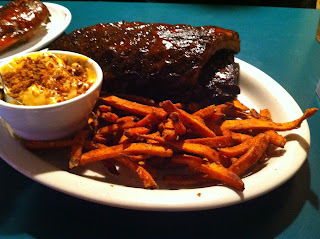 While SD has a great patio and plenty of seats, I was really dissapointed with the sauces and flavor of our ribs. I love BBQ sauce and have tried my best to check out almost every BBQ spot in town. As I've said before, the sauce makes the meal and Smoke Daddy just didn't have that day. There are three table side bottles to choose from - original, sweet and smokey and mustard q. All are vinegar based (not my favorite) and none quite stood out with originality. I found my best flavors with combining the mustard q with the sweet/smokey. We ordered a chicken + ribs platter, with sides of mac cheese and sweet potato fries. The food came ridiculously fast (a necessity since we were heading to a bulls game) but somewhat curious. I thought the ribs were cooked ok but didn't have anything to put on them, which was needed. Erica is the mac 'n cheese expert and that didn't quite pass the test since it seemed too easy to replicate at home (and not very creamy or cheesy). 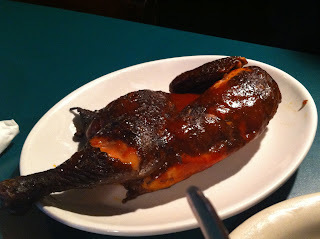 To our surprise the half chicken that arrived second was cooked to perfection - tender but super moist with a crispy skin. I was full at that point but kept eating the chicken because it was the best thing we ordered. If it were allowed I would order that chicken but BYOQ (bring your own bbq sauce). We were in a rush so maybe I'm passing judgement too fast and we also didn't get to eat a lot of items on the menu. However, it doesn't take long for me to enjoy good bbq sauce and good ribs (it must be a midwestern thing). Smoke Daddy is an institution and isn't going anywhere. The fact that it's down the street from me only adds to the likely hood I'll be back at some point. But with other great bbq spots in the city (with a favorite Lillie's Q down the street), I would take a lot of convincing to go to SD for a bbq meal versus the other options.